Heptathlon Queen Swapna Barman is Aims for 2020 Olympics. The 2018 Asian Games marked a milestone in the history of athletics in India. The battle-hardened Heptathlon Queen Swapna Barman swept through the 2018 Asian Games. For the first time in history, India wins Gold Medal in the category of female Heptathlon. Heptathlon Queen is a young girl from West Bengal where she has been training since she was a child. At an early age, the little Swapna was incorporated into the training protocol of the Jalpaiguri District Sports Association, at the behest of the now deceased Samir Das. Swapna is a special woman for many reasons. She is determined to succeed and possesses the heart of a fighter. During the 2018 Asian Games she suffered from a dental condition, but that did not stop her determination to continue until she reached the Gold goal. She did it in style. Swapna comes from a working family and her father is a rickshaw puller. She grew up in an environment where the sport is an essential part of life. This unique girl was born with an extra toe on each foot, it does not affect her athletic performance but after the 2018 Asian Games, she made a call for personalized shoes. She says, "I wear normal shoes worn by people who have five normal toes. It really hurts during training. It's very uncomfortable, whether you wear spikes or normal shoes". Despite all the prognoses she brought the gold to India. This athlete's tenacity is evident not only in her commitment to arduous and continuous training. Her physical peculiarities forced her to increase her levels of resistance to pain, which is a plus for a heptatlonist. This discipline requires uncommon physical skills, but fundamentally it demands that the athlete has the mentality of the winner. The heptathlon is the discipline of steel athletes and she surely has proved to be one. Cricket star Rahul Dravid knows about Swapna Barman's talent and the difficulties she faced. Dravid managed the incorporation of Heptathlon Queen into the Rahul Dravid Athlete Mentoring Program. The cricket star through his program established a golden duo with the Jalpaiguri girl. 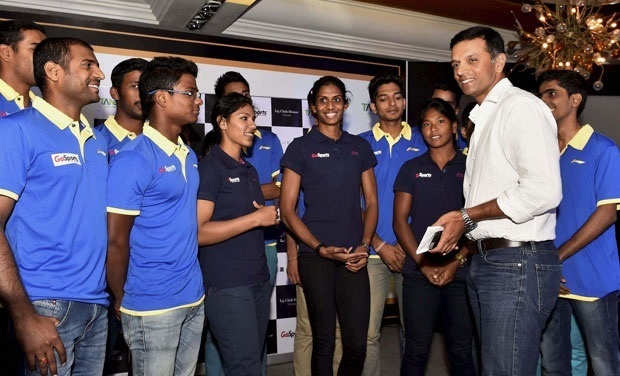 The Rahul Dravid Athlete Mentorship Program is a sponsorship and mentoring program aimed at athletes from rural areas. The program is directed by The Wall Rahul Dravid and supported by Go Sports Foundation. During the 2018 Asian Games, 19 of the participating Indian athletes were sponsored by this program. For athletes in rural regions, being supported by the legendary Rahul Dravid is an incentive to succeed. In addition to funding, the Athlete Mentorship Program provides guidance at various stages of an athlete's professional life. Training programs are designed based on specific goals. Currently, the goal is the 2020 Olympic Games. Heptathlon Queen started the long way of a high-performance athlete at a very young age. In 2014, at just 17 years old, she won 5th place in the Asian Games in Icheon. That same year she won silver in the Asian Junior Games. Swapna suffered a painful back injury and her performance decreased during the IAAF World Athletics Championships in 2017. Her physical trainers recommended that she withdraw from the competition, but she refused. She competed with severe pains and ranked 26th. The painful experience of 2017 was a lesson in strength for Swapna. That strength was present in the Asian Games when even suffering from severe pains in the jaw she managed to finish the competition and come out triumphant. Heptathlon Queen trains at the Indian Sports Authority Training Centre (SAI). Under a rigorous training regime, Swapna Berman looks towards the World Athletics Championships as a preliminary step to reach the 2020 Olympic Games. Every athlete's dream is to achieve glory in the Olympic Games. For the young Swapna Barman, that dream is very close. She says "Time goes by very quickly so I have to train very hard, the Tokyo Olympics are less than two years away". Swapna Barman continues to be a young woman with responsibilities to her family. Her father suffered a stroke that limited his functions and the family's financial situation is difficult. These challenges weigh continuously on the shoulders of Heptathlon Queen and the stress causes eventual physical affections that diminish her performance. The support of organizations such as the Go Sports Foundation and personalities such as Rahul Dravid open the way to new horizons for Swapna and her family. She, like many other athletes from rural areas, requires institutional commitment and the financial backing of private organizations to support her sporting growth. This girl from Jalpaiguri is the image of India's best-kept secret: Steel Youth. Swapna's triumph during the 2018 Asian Games is a sample of the achievements that the Indian nation can achieve through the steel mettle of athletes like the Heptathlon Queen.